Leaving the EU is an enormous challenge for the UK and will affect generations to come. MPs have the weight of that responsibility on their shoulders, and no MP takes that responsibility lightly. In extraordinarily difficult circumstances, where just over half the country voted Leave, I think the Prime Minister has shown her determination to respect the outcome of the EU referendum, while simultaneously protecting jobs, minimising the damage to our economy and avoiding a hard border on the island of Ireland. As a committed unionist, Theresa May has also ensured that both the constitutional guarantee for Northern Ireland and the consent principle of the Belfast Agreement are reflected in the Withdrawal Agreement and the Political Declaration, and they will be again when a final deal is struck on the future relationship between the UK and the EU. So, Northern Ireland’s constitutional status within the United Kingdom continues to be in our own hands. And as unionists we will determine our future with confidence, not with fear. As for the so-called “backstop”, it would apply if, and only if, at the end of the transition period on 31st December 2020, the UK and the EU have failed to agree their future trading relationship. However, the British Government and the EU have been very clear they do not want to see any backstop coming into operation. So, there are major incentives for both sides to negotiate a good future trading relationship for the entire UK, thereby avoiding the need for the backstop. I have been particularly struck by the number of businesses in Northern Ireland, farmers, community leaders and fishermen who have said they believe Theresa May’s Brexit deal is a good one for Northern Ireland. Can they all be wrong? Of course, not. I believe they have got it absolutely right. And in supporting the Prime Minister’s deal, they are taking a pragmatic approach, not a political one. If MPs vote down the deal next Tuesday, we risk crashing out of the EU on 29th March 2019 and that would be a disaster for jobs and for our economy. It could also impact on the constitutional status of Northern Ireland within the UK, because a no-deal Brexit would mean a hard border on the island of Ireland. Sinn Fein would inevitably exploit a hard border for political gain with increased demands for a border poll every time we have an election. I have no intention whatsoever of gifting Sinn Fein that opportunity. Last, but not least, it is worth looking at the tactics of the Labour Party. Labour repeatedly says it will not support May’s deal. 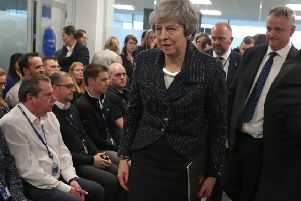 They want to sink Theresa May, her deal and the government in order to precipitate a General Election where they expect to see Jeremy Corbyn returned as Prime Minister. Having Corbyn as Prime Minister would be an unmitigated disaster for Britain, for Northern Ireland and, more particularly, for unionism and I am not prepared to take that risk, even if others are. Although the Prime Minister’s Brexit deal is not perfect, I will vote to support her efforts to achieve the best deal for the whole of the United Kingdom, one which protects jobs in Northern Ireland and also protects Northern Ireland’s constitutional status and the consent principle as guaranteed by the Belfast Agreement.